Worship and rituals are given utmost importance in Hindu Dharma. Every deity in the Trinity panel has a unique aspect portrayed by the idiosyncratic symbol they are seen with. These symbols might be the weapon they carry, their attire, or any other thing like a book or a flower. The symbolism of Brahma, Vishnu and Shiva can be explained in the form of deep philosophical connections with different forms of energies and desires. Let’s have a look at different meanings of different symbols of the Trinity of Hindu deities. Often recognized by the four heads and four arms, Lord Brahma is the supreme god in the deity panel. His four faces symbolize the four Vedas, namely, the Rigveda, the Yajurveda, the Samaveda and the Atharvaveda. Following this, his four hands reflect the four aspects of human nature, Mind, Intellect, Ego, and Conditioned Consciousness. Lotus reflects the Supreme Reality. The Utensil full of Water signifies the cosmic energy of creation. The Mala is a symbol of time. 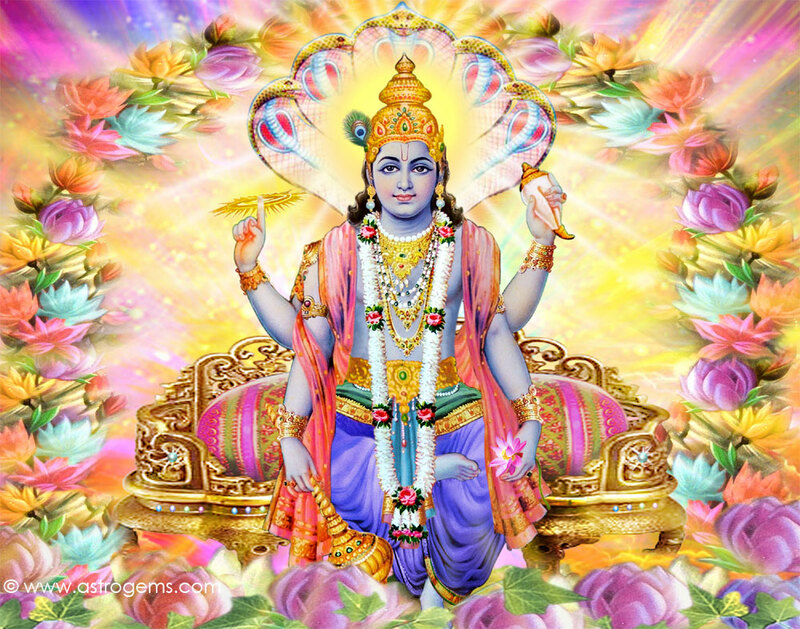 The God of Protection and restoration of Dharma, Lord Vishnu is seen in a pale blue complexion with four arms. These represent his omnipotence and omnipresence. The Sudarshan Chakra – The disc like weapon has a deeper meaning to its existence. It’s 6 spokes represent the 6 uncontrollable seasons. Furthermore, according to Rig Vedas, it is a symbol of the Sun. It allegorically associates with the unstoppable time and unceasable moments of the sun. The Shankh or Conch – The sound emitted by the conch represents the creation of the universe. Not only this but the shankha also depicts the five elements, namely, water, fire, air, earth, and sky. Kaumodaki, The Gada – It represents the destruction of an evil human trait i.e. ego. Moreover, it symbolizes the physical and the mental strength. According to GOPAL-UTTARTAPANI Upanishad, it is a symbol of primeval knowledge. The Lotus- It is the source of awakened consciousness and the symbol of purity, prosperity, and truth. The formless, the limitless, Lord Shiva is an epitome of extreme power. His third eye that burns things into ashes opens when he surpasses every bar of his limitless anger. It is often seen as the eye of wisdom. His eye has the ability to see beyond the physical aspects of life following the destruction of the evil. The Crescent Moon- Time cycle of creation from the beginning to the end. Next, it also refers to Soma, the source of intoxication. Intoxicated yet alert is what the moon tries to depict. Lord Shiva has a perfect control over the minds. The Snake- It represents the positive side of an ego. Ego can be worn as an ornament if controlled in a proper way. Also, the garland of snake represents the endless cycle of regeneration and birth. Following this, it is believed that by wearing the snake as an ornament Lord Shiva defeats all the fears. Damru – It brings into picture Shiva as Nataraja. Nandi – Serving as a mount to Lord Shiva, it represents purity and justice. Furthermore, it conveys the message that soul should always serve the God and symbolizes the eternal waiting which is considered as the biggest virtue. The trinity is the strongest and so are the beliefs and meanings of its symbols.